Zoom Boom Training Grande Prairie - Zoom Boom Training is intended to train operators on variable reach forklifts. The goals of the training are to be able to impart an understanding of the physics of the machine, and to outline the operator's tasks. 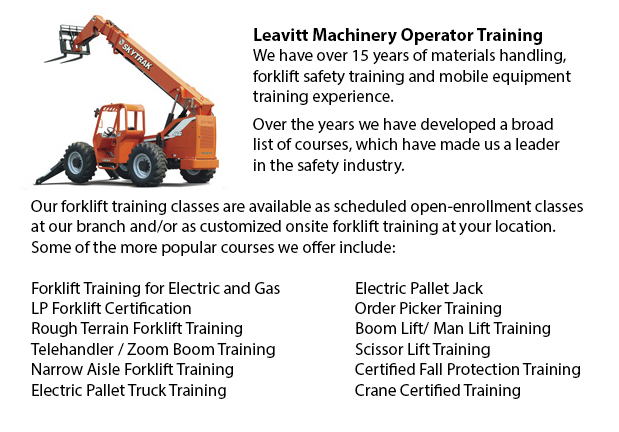 This program follows North American safety standards for lift trucks. Zoom boom training and certification is accessible at the company's location or at our site, provided there are a few individuals training. Certification received upon successful completion is valid for three years. A telescopic handler (likewise referred to as a telehandler) is similar in some ways to both a forklift and a crane. It is a useful equipment constructed with a telescopic boom which could extend forwards and lift upwards. Different attachments can be connected on the end of the boom, like bucket, pallet forks, lift table or muck grab. It is popular in agriculture and industry settings. The telehandler is a common used together with fork attachments in order to enable the transporting of loads. Telehandlers have the advantage of being able to reach those inaccessible places that cannot be reached by a standard forklift. Telehandlers can remove palletized loads from inside a trailer and putting them on high places like for example rooftops. For some applications, they can be more practical and efficient than a crane. While lifting heavy loads, the telehandler might experience some unsteadiness. As the boom is extended very far with a load, the machine would become more unstable. Counterweights found at the back help, but don't solve the problem. The lifting capacity quickly decreases when the working radius increases. Several machines come together with front outriggers which extend the lifting capacity whilst the equipment is stationary. A load chart helps the operator to determine whether a given load is very heavy. Factors like load weight, boom angle and height are calculated. Some telehandlers have sensors that provide a warning or cut off further control if the unit is in danger of destabilizing.